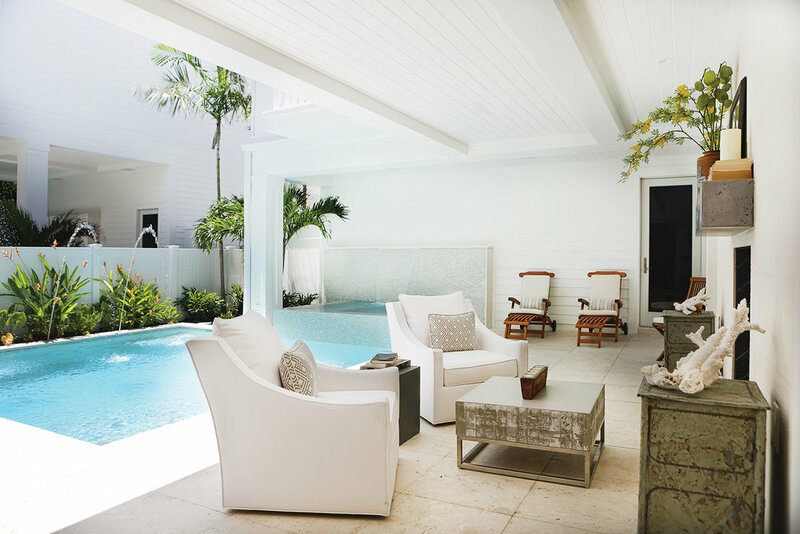 The Poinciana Cottage represents a new design aesthetic Naples has not yet experienced. Located on 6th Street, right off 5th Avenue South, the cottage’s urban décor and loft-like feel fits perfectly into this downtown space. 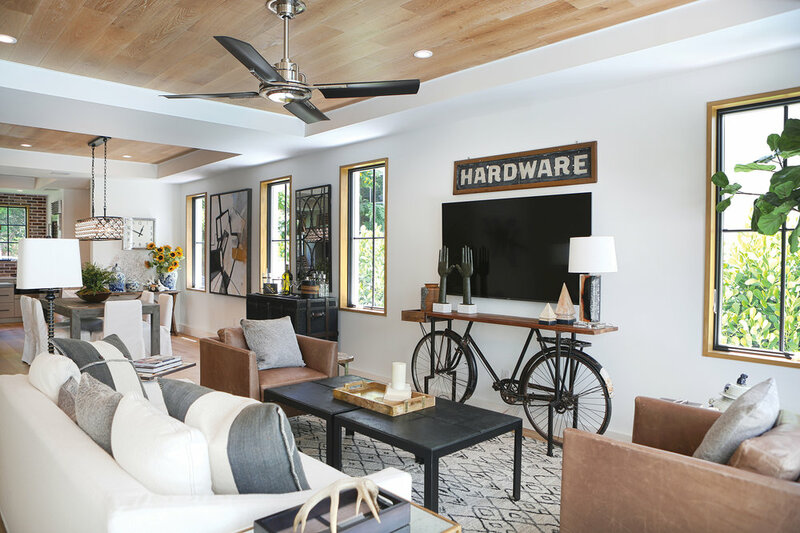 Warm woods, unique stone accents, Old Chicago-style brick, and dark mullions come together to create an environment that blends the best city of living with the relaxed Naples style people love and expect when buying a home like the Poinciana Cottage. The cottage is the middle home in a line of three unique properties by developer Kristen Williams. Williams has managed to create a feeling of history and established design with this project, and it’s not unusual for passersby to take photos of the homes thinking they are walking past historic Naples cottages. Although this is a brand new build, the unique elements woven throughout the interior and exterior of the home gives it a timeless feel. “There is a history to this space,” explains broker Mary Katherine White, who co-lists this home with Chris Wells of Olde Naples Real Estate. “A Naples pioneer and artist moved from England and settled on the property in the 1940s. He began painting when 6th Street was just a swamp and Naples didn’t yet boast one of the best downtowns in the county. This artist left a visual heritage in his art studio which was located at the back of the property.” Williams moved the studio and 2,000 of his paintings to the Collier County Museum before the unredeemable houses were torn down. Now, this crisp new home is standing tall and proud, adding to the beauty of downtown Old Naples. The home’s layout was created to take advantage of the indoor/outdoor living opportunities so many people desire when they move to Naples. By putting the kitchen at the front of the home, Williams was able to place the seating areas in a way that maximizes access to the pool and courtyard. When people enter the home and move into the spacious kitchen and dining room area, their first instinct is to touch the unusual leathered black and white granite above the gas Wolf range. The custom island with built-in seating adds more work space and creates an interesting conversation piece. The table sits below two cinematic-inspired lights—just the beginning of the great lighting choices Williams sprinkled throughout the home. The old world brick walls add warmth and uniqueness to the room. “You rarely see brick of any kind in Naples but I think this home shows how well it works in our coastal setting,” says Wells. The custom cabinetry in Chantilly White by Ruffino Cabinetry is topped with Calcutta Statuario marble counters. Aged iron Alice sconces flank the sink and add an industrial-chic vibe. 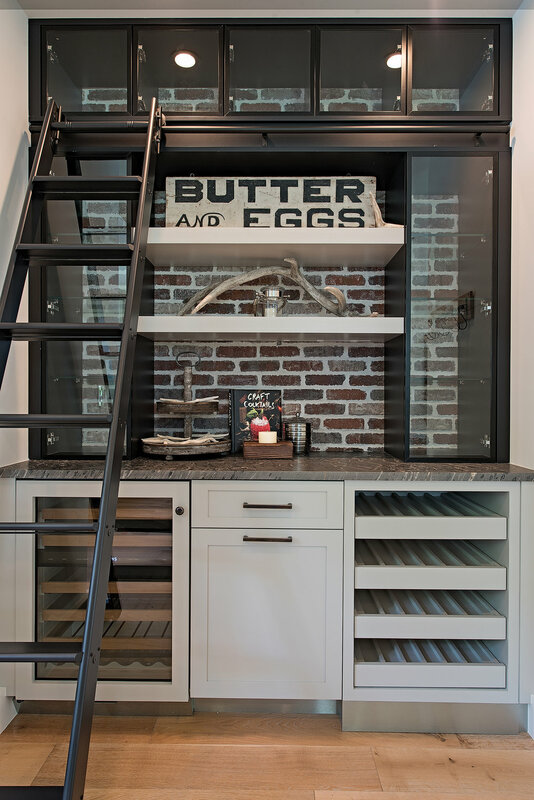 he whimsical library ladder and open shelving adds a fun element to the bar area in the kitchen. The wine cooler and storage racks create the perfect launching pad for a night of entertaining. Just off the kitchen, the dining room’s focal point is the stunning chandelier with metal and glass details. The table mixes the look of reclaimed wood with modern lines, representing the mix of old and new throughout the home. Linen-covered chairs keep the space light and airy while abstract art adds another element of visual interest to the space. In the living room, the unique media stand was created from an old bicycle and enhances the urban loft feel of the home while giving a nod to the bikeable streets of Old Naples. A mix of leather and linen-covered furniture creates a beautiful seating arrangement. 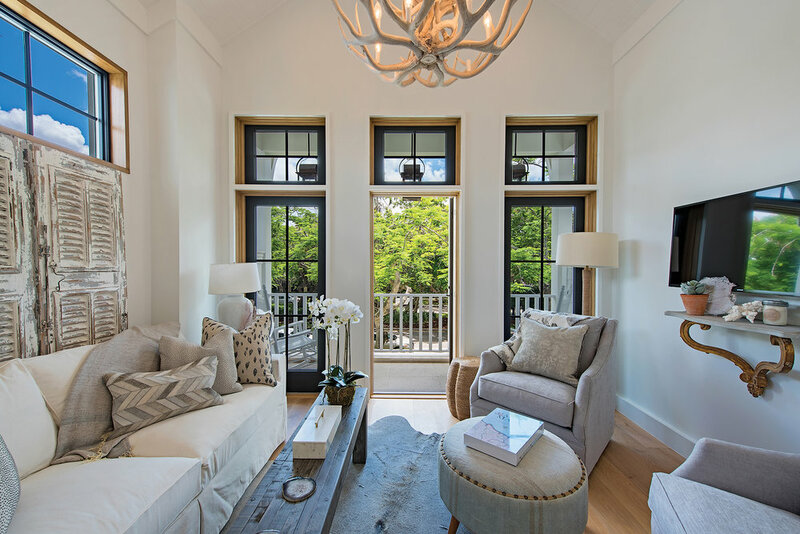 Here, the natural wood-cased windows add to the character of the home as they let the Florida sunshine through. This room is also adjacent to the pool area and courtyard so the new owners can easily take advantage of the outdoor space beyond. Across from the living room is a more intimate seating area perfectly suited for game nights with friends. 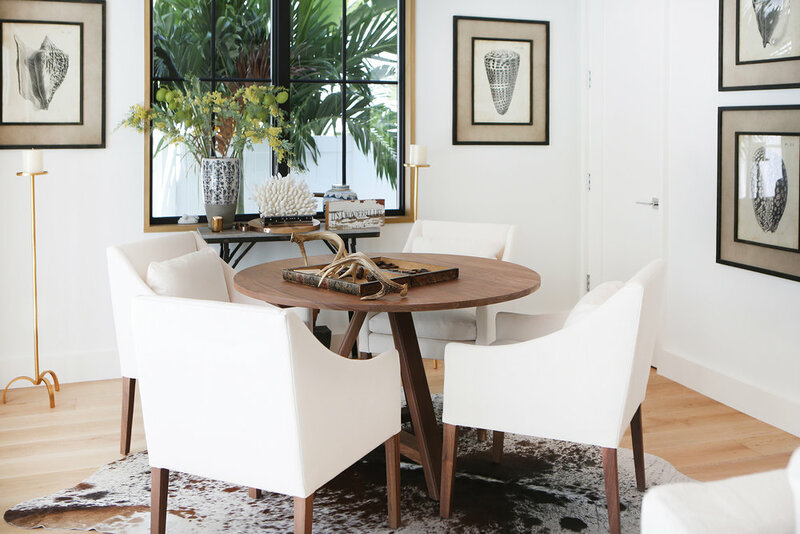 Williams kept the wood surfaces in the home light and the lines clean and modern but has accented them with classic elements like the hide rug and nature art prints. Another theme throughout the home is the use of antlers which add a rustic aesthetic. The master bedroom, one of five in the home, is a relaxing retreat with custom vaulted ceilings and recessed lighting, along with a palette of white and grey. The poster bed’s clean lines offer a new take on classic design elements that contrast beautifully with the elegant side tables. Throughout the home, wide plank rubbed oak floors in a whiskey finish create a warm foundation for each room. The woven basket light above the bed fills airspace giving the room proportion and scale. The upstairs living area is a great mix of lightness with industrial influence. Antique doors provide privacy and sun protection while the hide rug and antler chandelier continue the rustic elegance in the home. The second floor veranda is also the perfect space for people-watching and enjoying the outdoors. The lanai is private, spacious, and provides a retreat from the hustle and bustle of downtown. A well-proportioned pool with a raised spa provides the perfect area to relax and enjoy a sunny day or a comfortable evening at home. The tongue and groove ceilings create a shade for the beautiful furniture that would fit just as well inside the home as out. On the other side of the lanai, a door leads to the two-car garage with private driveway. This home is for sale for $4,399,000. Contact Olde Naples Real Estate for more information.